We’ve just received the telephone call and the tweet to confirm that we have been awarded Eco-School Ambassador status. Congratulations Everton Nursery and Family Centre, #Everton, #Liverpool, you are an Ambassador School! This is a brilliant achievement for Everton Nursery School and Family Centre and reflects all of the hard work of our Environmental Teacher, Lesley Donohue and of our Eco Commitee. See below for more information about the Eco School Ambassador Role. An Eco-School Ambassador is an inspirational flagship school of the Eco-Schools programme that has completed in-depth work on all nine Eco-Schools topics and ensured sustainability is embedded into the curriculum. As an Eco-School they have successfully delivered change in the culture of the school. An Eco-Schools Ambassador will be able to demonstrate successful pupil and community interaction and are supporting and sharing information and advice with other schools and Eco-Communities (Eco-Homes and Eco-Schools). Being an Eco-Schools Ambassador is not a next step as a Green Flag Eco-School, the school aims to fulfil a position of responsibility and is given the role for two years. The role is undertaken by inspirational Green Flag schools that currently extend their support and commitment to sustainability and the wider community. Our Ambassadors are leaders, who are the forefront of the Eco-Communities campaign, they extend the ethos of Eco-Schools far beyond the school gates. On Wednesday 27th February 2013, Everton Nursery School and Family Centre was assessed as part of our application to attain Eco Schools Ambassador Status. 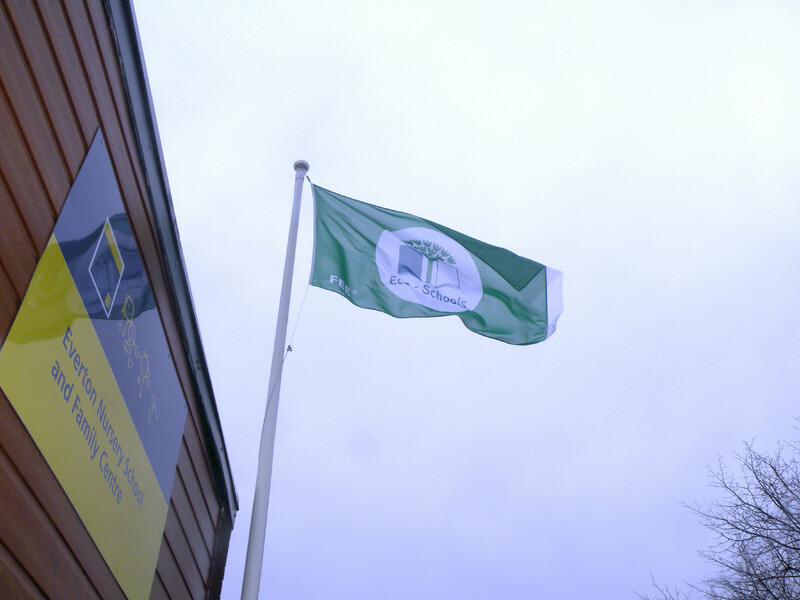 During the same visit, we were also inspected for our 4th Eco Schools Green Flag. We are delighted to announce that we have been awarded our 4th Green Flag and we await the decision regarding Ambassador Status in May. The award is due to the hard work of Lesley Donohue and the rest of our Eco Committee. For more information about the Environmental Curriculum for the EYFS at Everton Nursery School and Family Centre practitioners can purchase an eco file from our website, or E-mail the Centre evertonecc@talk21.com. On Monday 15th October 2012, Everton Nursery School and Family Centre were inspected for the E safety 360 award by Tony Ryan and Ron Richards. Our application, which was led by Matthew Farrell has involved numerous policy updates, workshops and advice sessions. Do you shop at Asda Breck Road? 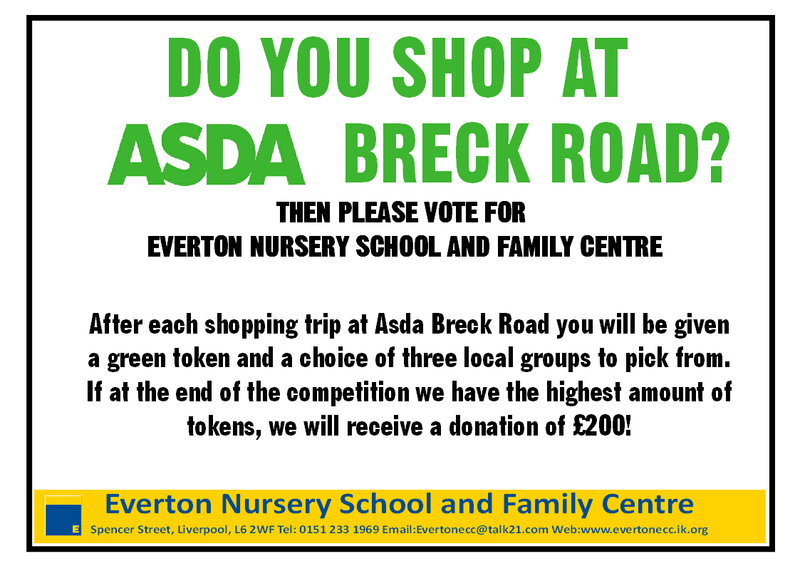 Everytime you shop at Asda Breck Road you will be given a green token. Please put your green token into the box labelled Everton Nursery School and Family Centre. If we get the most tokens we will win a donation of £200! Everton Nursery School and Family Centre can proudly announce they have been awarded the Investors in People Silver Award.